In an interview with Billboard posted today, Apple Music executive Jimmy Iovine has discussed a number of topics related to the streaming music service's "long game," including its growth over the past three months. 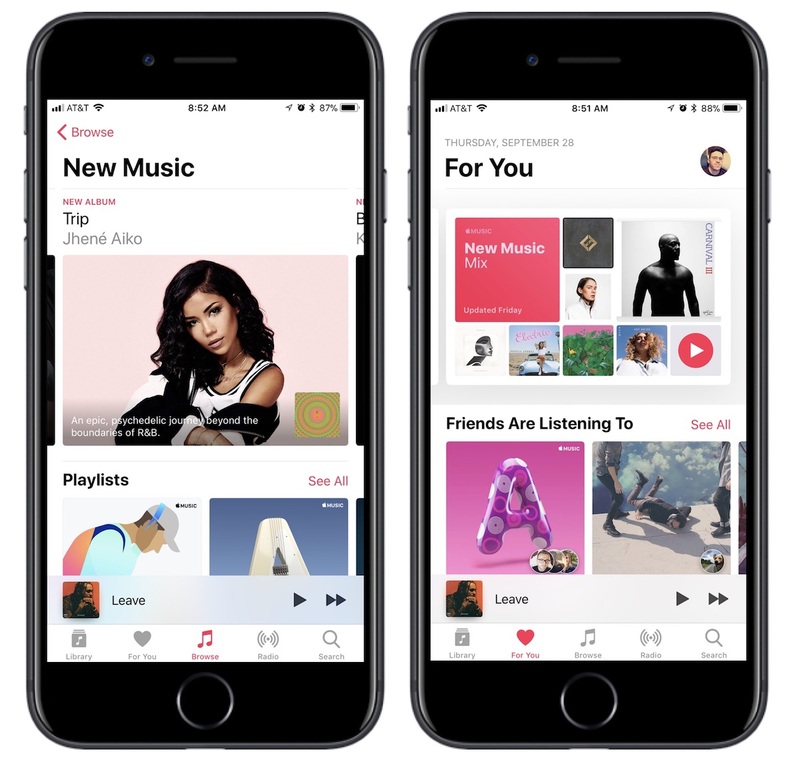 At WWDC in June, Apple mentioned that Apple Music had 27 million paid subscribers, and today the company confirmed to Billboard that it has now reached "well over" 30 million. Iovine was enthusiastic about Apple Music's growth, but admitted that simply adding more subscribers, launching entire back catalogues through record label deals, and staying on the forefront of new hits isn't enough to maintain Apple's presence in the streaming music market. "I just don't think streaming is enough as it is," he said. "I just don’t think streaming is enough as it is. I don’t agree that all things are going to be OK [just] because Apple came into streaming and the numbers went up. Look at the catalog: It’s a matter of time before the ’60s become the ’50s and the ’50s become the ’40s. The people that are listening to the ’60s will die -- I’m one of them. Life goes on. So you have to help the artists create new stuff that they would never be able to do on their own." Apple Music's main rival remains Spotify, which counted 60 million paid subscribers in July. Spotify has continued to grow faster than Apple Music thanks to the former streaming service's free tier that allows users to listen to music interspersed with advertisements, which Apple Music does not have. Apple's offer for new users is a three-month free trial to test out the service before deciding to pay the $9.99/month price point. In May, Iovine said that if Apple Music did have a free tier, "it would have 400 million people on it" and make his job easier, but he and Apple believe in focusing everything into creating a quality experience for the people who are paid subscribers, making them "feel special" in the process. Check out Billboard's full interview with Jimmy Iovine, Zane Lowe, and Larry Jackson right here. Other topics discussed include how the Apple Music team discovers new artists, Spotify's plan to go public, and Iovine's belief that while Apple Music is good where it's at, the company is "not even close" to being done with iterating and adding onto its features. 30m people have never tried Spotify. I tried it, didn't like it. Simple. Which only leaves the other 470,000,000 Apple ID users with a ****** music app and experience. Nice job, Apple! I prefer AM because it’s built into my Mac, iPhone and AW. Plus it’s integrated into Siri as well. This is a good point; I don't ever think about this since I have the service. I'm curious why it's crap now? Several things happened when they integrated AM into the music app that made listening to music for non-AM subscribers anywhere from a hassle to downright painful. If you don't want all those purchases, that you didn't download/sync, in your library, and you don't want to use your data for streaming, or just can't, you have to go into "Downloaded Music" every single time you want to use the music app the way you used to be able to use the app out-of-the-box. Which I assume is the way myself and anyone else not subscribing to AM would like to use the app. In essence, they borked the music app for anyone who doesn't subscribe to AM, anyone who doesn't want to stream their music, and anyone that spends any time at all curating the music and playlists they sync to their phones. Not even to mention the headaches of using music on CarPlay without AM. Man reading the first few responses, people just hate anything to do with Apple. lol. If you listen to playlists all the time, go with Spotify. If you truly care about your library, go with Apple Music. Bravo, what a sensible thing to say! That's so rare on the Macrumors forums I had to create account. Usually it's just a cesspool of confirmation bias and just a giant echo chamber. edit: I'm a playlist guy. I created now several giant playlists with 2-3 genres and as they grow I break them down into small playlists. I use both, and there is a reason why I'm sticking with Apple Music. It's the only service in which I can add songs into my library from albums I bought, and they behave like songs from Apple Music (they sync, there are ready to stream or download in any of my devices). Plus, it is the only service that allows you to edit songs' metadata (changing genres, albums cover art). Plus, My Chill Mix has spot on suggestions for me. They are actually better than those I had with My Daily Mix on Spotify. Playlists are the the main reason I went to Spotify over Apple Music. The ability to share them, see people's playlists, etc. I've got good news for you. With iOS 11 and High Sierra it's possible to share public and private playlists on Apple Music. This is why Apple is not the ghost of its past. People say about confused product lines or lack of refreshed devices. The fact is, from this and the App store income alone - it is a tremendously solid money printing machine.